Happy Monday! I hope your day is magical! This piece of art is by Jessica Galbreth. :) Enjoy! What Romantic Heroine Are You? You are Arwen from Lord of the Rings. You are kind and brave, to choose mortal life with the one you love over immortality without him. Well, as you all know I'm a fan of quizzes...LOL I snatched this one from Donna Grant's blog! The character of Arwen is one of my favourites from LOTR! Contract for Do Or Die!!! Contest at The Historical Romance Club! You could WIN one of Four GRAND PRIZES! 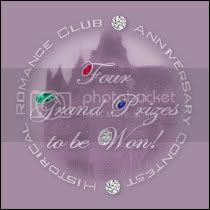 Historical Romance Club is celebrating it's 4th Anniversary with a HUGE Contest! With over Forty books generously donated by some of your favorite Romance Authors, we are giving away Four GRAND PRIZES. The Diamond Prize Package; The Ruby Prize Package; The Emerald Prize Package; and The Sapphire Prize Package. Each package contains a mix of both eBooks and Print Books. July 31, 2007 at 9:00pm EDT, so hurry and enter today! And while you're visiting HRC, check out our extensive list of HRC Authors, Reviews, and Interviews. My latest release from The Wild Rose Press, SWEET REVENGE is now available! WOO HOO! You can purchase it by following this link! It's published under the English Tea Rose Line as a miniature rose! It's my debut release in this line at The Wild Rose Press, so, I'm quite excited! It's a regency suspense, so if you're into that genre this story is for you! Lady Carys Richardson is a woman set on a mission. She’s convinced her brother, Charles was murdered during his service in the Napoleonic wars. On her path to vengeance, she falls in love with the Duke of Penrose, Thomas Williams. Thomas was her brother’s commanding officer in the Navy. Her investigation leads her to point the accusatory finger in Thomas’s direction and her world begins to unravel. Lord Thomas Williams is a duke with wealth and power. He also is a man that knows too much without having enough evidence. When he finds out that Carys believes him to be the murderer, his heart is broken. But he hasn’t lost his faith in Carys nor can he stop loving her. When Carys finally realizes her horrendous mistake, will it be too late to right the wrongs of the past and bring the true killer to justice? One more day until the release of Sweet Revenge! Woo-Hoo! I'm really looking forward to this release since it's my debut English Tea Rose, with The Wild Rose Press. I'm not a debut author in the category of historical, since I'll Be Yours, published with New Concepts Publishing is a historical. The release date for Sweet Revenge is Wednesday, June 13th! Woo-Hoo! 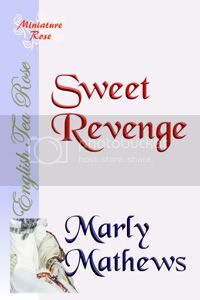 :) Sweet Revenge is a regency suspense, and it will be published under the English Tea Rose Line at The Wild Rose Press. Below is the blurb and the cover! Lady Carys Richardson is a woman set on a mission. She’s convinced her brother, Charles was murdered during his service in the Napoleonic wars. On her path to vengeance, she falls in love with the Duke of Penrose, Thomas Williams. Thomas was her brother’s commanding officer in the Navy. Her investigation leads her to point the accusatory finger in Thomas’s direction and her world begins to unravel. Lord Thomas Williams is a duke with wealth and power. He also is a man that knows too much without having enough evidence. When he finds out that Carys believes him to be the murderer, his heart is broken. But he hasn’t lost his faith in Carys nor can he stop loving her. When Carys finally realizes her horrendous mistake, will it be too late to right the wrongs of the past and bring the true killer to justice?